Carlin Isles (born November 21, 1989) is an American rugby union and rugby sevens player. Isles plays for the United States national rugby sevens team. Isles had been predicted as the fastest rugby player in the world. Isles and his twin sister, Tambra, grew up Massillion, Ohio in foster homes, rarely seeing their mother. Often hungry, he ate what he could as a child, including dog food. At the age of seven the siblings were adopted by Starlett and Charles Isles; Isles credits his adoptive parents with providing the stability and love he needed to excel in sports. 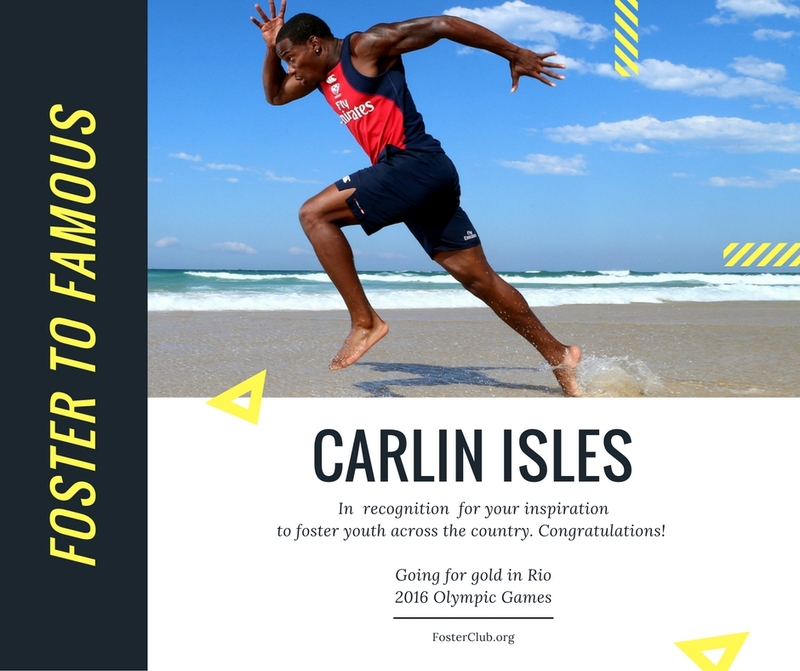 Carlin Isles was a gifted American football and Track and Field athlete while attending Jackson High School (Massillon, Ohio). Isles holds the school records in the long jump, 100 meter, 200 meter, and 400 meter events at Jackson. He was also a part of the record holding 4 × 200 m relay team at Jackson High School. His 2007 100m school record breaking time was 10.58 seconds which was also a county record at that time. Carlin was a two-time, back-to-back OATCCC Indoor State Champion in high school in the 60m dash running 6.83 seconds which was a Division I meet record up until March 2012. He was a state runner-up in the 200m dash his junior year and runner-up in the long jump and 100m dash his senior year in addition to being third in the state in the 100m dash his junior year. In his senior year at Jackson High School, Isles ran a 4.28 second, electronically timed 40 yard dash. Carlin was an all-conference, all-county football player as well. Before taking up rugby in 2012, Isles ranked as the 36th fastest sprinter in the United States with a 100 metres outdoor personal best of 10.24 seconds. Isles took up the sport of rugby in 2012. He was encouraged to begin playing rugby by Miles Craigwell, another crossover athlete from American football who ended up playing rugby for the United States national team. Isles played his club rugby with the Gentlemen of Aspen RFC, based in Aspen, Colorado. Isles first caught the attention of the rugby media in summer of 2012 when Rugby Mag dubbed him "The Fastest Man in American Rugby." Isles played for the US national developmental team Atlantis in July 2012 at the Victoria 7s tournament. "I've never seen anyone that quick on a rugby field ever ever, XVs or Sevens. I don't think anyone else has either." Isles is playing for the US national team at the 2016 Summer Olympics in Rio de Janeiro, Brazil, where rugby sevens will be reintroduced as an Olympic sport. Isles was under contract with Glasgow Warriors of the Pro12. In February 2014, he signed to play with Glasgow Warriors. He was a part of the Warriors 7's side that won the Melrose Sevens in April 2014. Isles did not make an appearance for Glasgow Warriors first XV that season but gained experience playing 15's with the BT Scottish Premiership side Ayr RFC, an amateur club in the Warriors district. At the end of the season Isles decided to leave the club and concentrate on playing rugby sevens in the 2016 Olympics. He was signed by the Detroit Lions on December 26, 2013 to the team's practice squad. During a workout with the Detroit Lions Isles ran a time of 4.22 seconds in the 40-yard dash, the fastest time recorded that year. In February 2014, Isles left the Lions to take up a contract with the Glasgow Warriors.